I have an existing rebate saw (or kerfing plane) with a fixed 3/8” fence. That’s great for most of my resawing needs, since I end up with 1/4” thick finished stock. But sometimes I need to work thicker. And sometimes I want to use the saw for cutting a rebate (rabbet). I thought about making a saw with an adjustable fence, but I still don’t have tools for threading dowels, and I really like the no fuss approach of a fixed fence, so I decided to make another fixed fence saw, this time with a 3/4” fence. That meant starting with a 7/4 or 8/4 chunk of wood. I had a scrap left over from having built my twin-screw vise, so I started marking it up and drilling holes (picture 4). I roughed in a handle with coping saw and rasps, and cut the rabbet in the bottom. 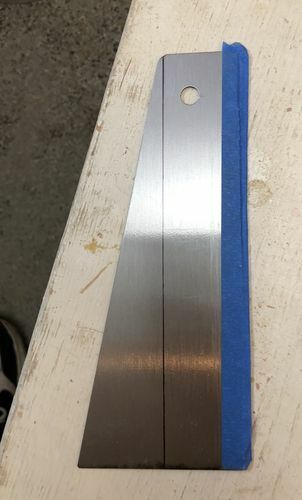 I used my existing kerfing plane, which gave me a 3/8” thick fence, and the blade mounted 3/8” from the side, and an almost perfect 3/4” thick cut (pictures 5 and 6). I also had a piece of a Great Neck panel saw, which I had a friend cut down for me. Once that was done, I started shopping around for saw nuts that would work in a 1.5” thick handle. Nobody wanted to sell them to me, so I got some barrel nuts and carriage bolts from Fastenal. The barrel is 5/16” diameter, which is almost exactly the size of the holes in the saw plate, and the threads are 1/4-20, which is dead common. I also practiced carving on the handle. It’s my first attempt, so it isn’t great, but it doesn’t make me cringe, so I’m happy with it. With all the parts acquired, drilling the holes for the saw nuts using my post drill was dead simple. Put a 1/4” hole all the way through the handle for the nuts, then come about an inch in with a 5/16” drill bit for the barrel. I had to adjust the hole in the saw plate by about 1/32 but that was quick work with a chainsaw file. Hit it with a coat of linseed oil and screw it together. Works like a charm! Great project, I like that! You did a beautiful job, the design on the handle reminds me of the old Disston saw design.Job Well Done! Thanks! Next project is my plane till, and since it’s all 3/4” lumber, I’m thinking I might need some 3/4” rabbets. The handle carving was meant to look traditional. I was surprised how easily it went with a v-tool and mallet. Yeah, Tony. I saw that, but the hex flower was easy to lay out with a compass and gave me some practice carving curves. Plus it was an excuse to repurpose a banged up cheap screwdriver into a stippling tool for the background. Thanks! That is a cool saw. I never saw one before..I learned something new today!! Thanks. Nice build Dave all around, useful tool, excellent craftsmanship on the construction, and some pretty good carving shows all as a handmade device. You should try making one of these with an adjustable fence, it’s not that hard and you don’t need a threading tool. Use a clamping bar on the adjustment arms. That’s what I did for my kerfing plane / saw build and this allows so much more use, especially for rabbets of varying dimensions. It’s a weird one Kenny. No tail. Jim, also known as a kerfing plane if you’re using it to make a kerf before resawing. I should go back and add a link to my other one. Yeah, I should make an adjustable one, but I do like the non-adjustable version too. So there will probably be another one sometime down the road. I like the retro look of it. The carving looks good too, especially your initials. Before long you are going to run out of space and have to make more cabinets, then move to a bigger shop with all of your hand made hand tools. Thanks, Earl. I’m told oak is one of the harder woods to carve well, so I guess I did ok.
That looks great Dave, and useful too! Nicely done! Thanks, Duck! I’ve gotten a lot of use out of the other one already, and it seemed like the hardest part of this was finding the overly long saw nuts. Having one to use as a pattern sure makes it easier.